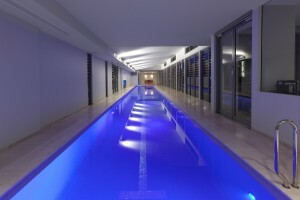 The ultimate luxury, a Sunset indoor lap pool and spa! 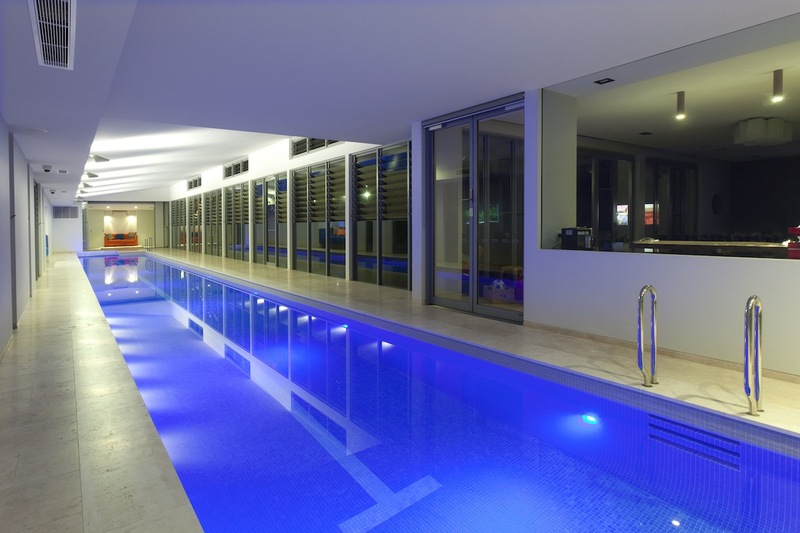 An indoor Sunset pool and spa must surely be the ultimate year round leisure environment, where you and your family can enjoy unrestricted recreation, private exercise, stylish entertaining or just swimming and relaxing for fun. 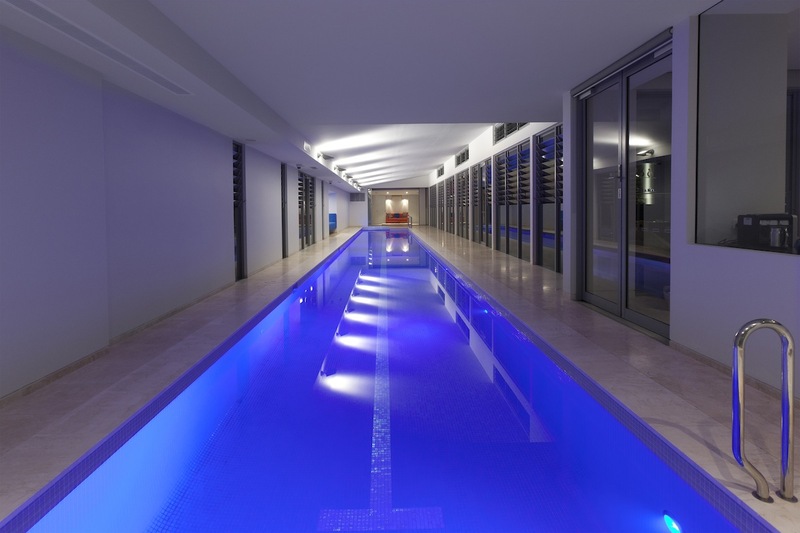 This luxury pool embodies a fastidious western Sydney residents’ ideal of incorporating an indoor spa and full sized swimming pool within their new home’s entertaining area. 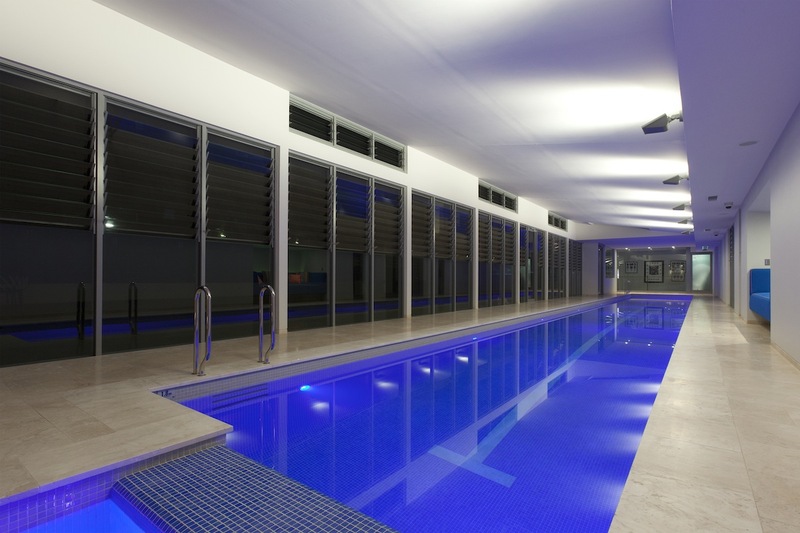 This Gold medal winning Sunset Pool is a genuine example of integration, where the swimming pool has been considered as an essential element within this award winning new home, and the focus of the resident family’s multifunctional leisure environment. Implementing uncompromising construction standards similar to Sunset’s outdoor in-ground, elevated and cantilevered infinity (wet edge) pools this contemporary residential leisure complex comprises a 25 x 3 metre lap pool and an adjoining large spa. 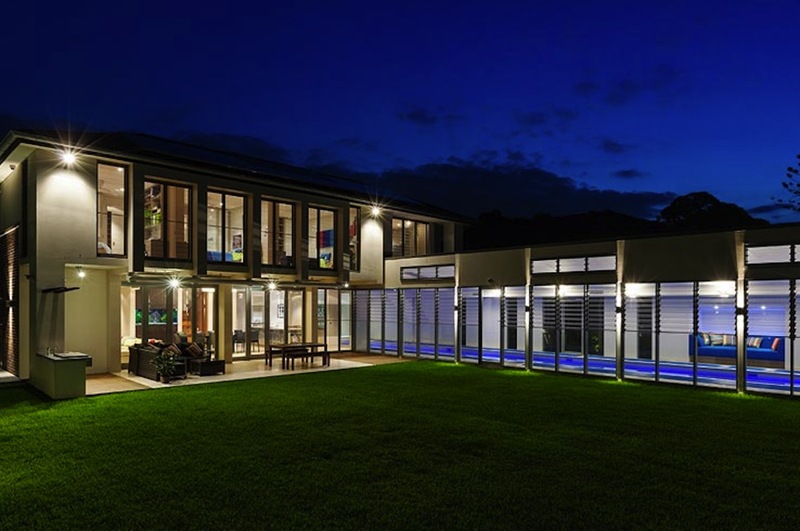 When you have a clear idea of what your dream home should include, Call Sunset Pools on 1300 000 412 to discuss your objectives and realise your dreams, or complete the enquiry form to put your plans into action. Similar to an outdoor pool’s relationship to its surrounding landscape, an indoor Sunset Pool is designed in concert with the aesthetics of the bespoke structure it occupies, where dimensions and mass must be considered on an internal domestic scale. This impressive Sunset Pools inclusion is directly accessible from the home’s lounge and kitchen, the self contained guest accommodation and the adjacent outdoor patio and BBQ area. The pool zones humidity, air temperature, water sanitation, filtration, and pool and spa heating are all digitally monitored and can be automatically adjusted to maintain the owner’s preferred conditions day and night regardless of the season. Finished to the highest standard with laser levelled natural travertine stone surrounds and a fully tiled glass mosaic shell, all surfaces are epoxy fixed and grouted to maintain their perfect appearance for decades to come. 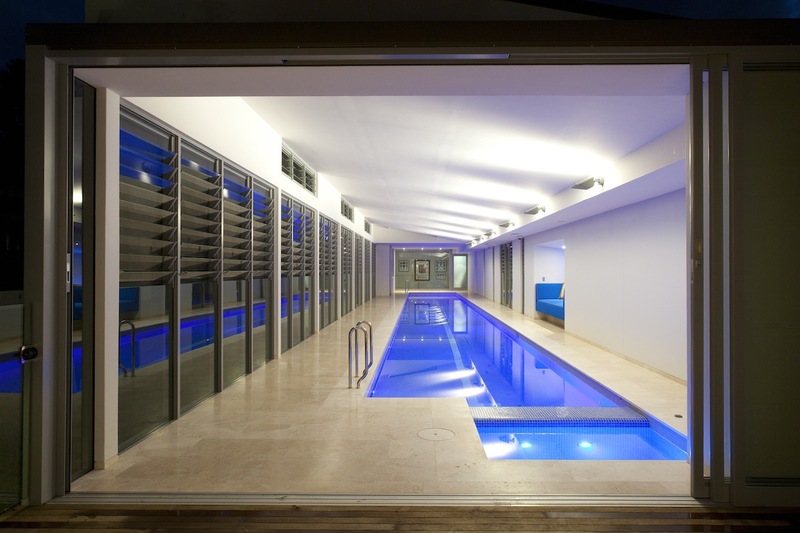 To maintain this pool and spa’s sleek minimalist profile Sunset Pools incorporated custom niche steps and flush mounted LED underwater lighting in the shell walls. This lap pool’s other subtle but practical additions include a step at the 2.2m deep end enabling swimmers to easily stand adjacent to the spa pool, a roll over weir so the family’s kids can slid in and out of the spa, non slip shallow end floor tiles enabling aqua aerobics plus Australian & Olympic standard swim lane ‘T’ markers to facilitate tumble turn training for those who take their swimming as well as their pool’s good looks seriously. Natural ventilation constantly brings fresh air into the pool zone through the extensive louvered windows that extend along the room’s garden side, Natural ventilation is supplemented by efficient mechanical aeration, dehumidifiers and heating to ensure the pool zone always remains inviting and comfortable year round regardless of the prevailing weather. Sunset Pools’ water management and computerised environmental control systems were conceived and engineered to be discreetly enclosed within the pool zone’s structure and linked to bespoke plant and storage rooms that isolate the Prominent UV sanitation system, the pools 3 Phase heat pump and the spa’s natural gas water heater from the tranquillity of the residence’s pool and spa zone. Computerised sanitation and pH correction is controlled by a commercial grade “Prominent” UV system with specialised individual ORP and pH dosing pumps and flow switches. Other operating equipment consists of a PC Aqualine computer, actuators, C-BUS compatibility, side spa switch, independent spa filtration, independent motor for spa jets, gas heater only for spa plus Accent Air heat pump & dehumidification system. By adopting and adapting premium commercial grade water filtration, heating and sanitation systems Sunset’s hydraulic solutions have established an unsurpassed quality standard for pool and spa water management efficiency, monitoring and control. 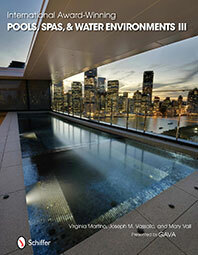 Attributes that Sunset bestows on the swimming pool renovation projects they undertake as well as all new builds. Sunset’s informed selection of filtration, sanitation and environmentally sensitive heating technologies means that all Sunset Pool owners’ can also look forward to the long term benefits of selecting a Sunset pool and spa. 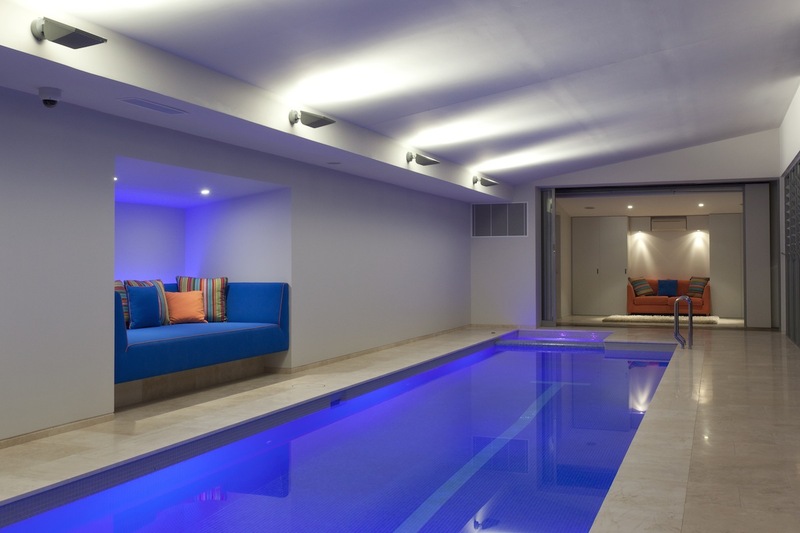 Sunset Pools’ principal Ben Thompson relies upon proactive cooperation between architects, engineers and construction companies throughout each pool’s design and development approval stage. He then invariably maintains direct involvement throughout construction, project managing every aspect of the build to ensure uncompromised high-end results for his clients. 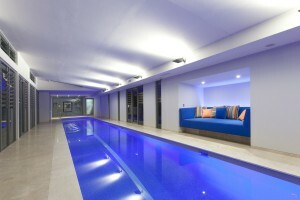 Sunset Pool’s unrivalled reputation has not simply been built on the unusual and exciting projects they are selected to undertake, but on the spectacular results they achieve for their Sydney clients. The result, as illustrated here, is a distinguishing new attribute to their Sunset Pools client’s residence, and an enhancement that adds a unique dimension to their lifestyle. If you would like to explore the benefits of owning an indoor swimming pool or spa, call Sunset Pools on 1300 000 412 to discuss your objectives and see how Sunset Pools can realise your dreams. 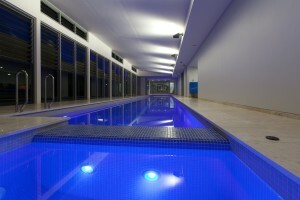 Alternatively e-mail Sunset Pools or complete the enquiry form and Ben Thompson will call you to make an appointment.